you can view, download, and print. 2 Arm Roasts and 4 Blade Chuck Roasts. 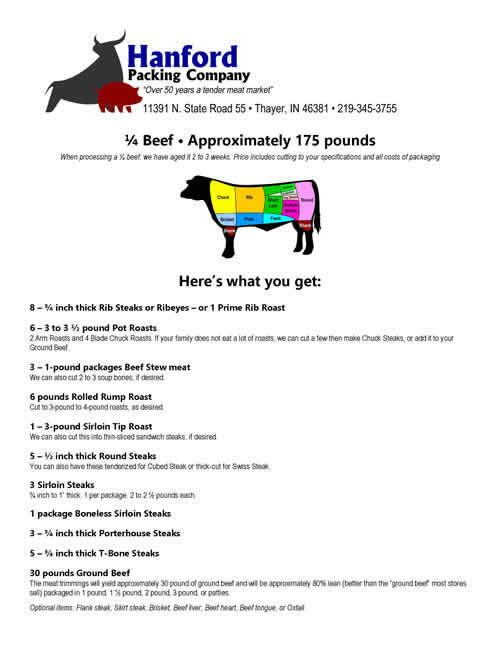 If your family does not eat a lot of roasts, we can cut a few then make Chuck Steaks, or add it to your Ground Beef. We can also cut 2 to 3 soup bones, if desired. Cut to 3-pound to 4-pound roasts, as desired. We can also cut this into thin-sliced sandwich steaks, if desired. You can also have these tenderized for Cubed Steak or thick-cut for Swiss Steak. ¾ inch to 1” thick. 1 per package. 2 to 2 ½ pounds each. 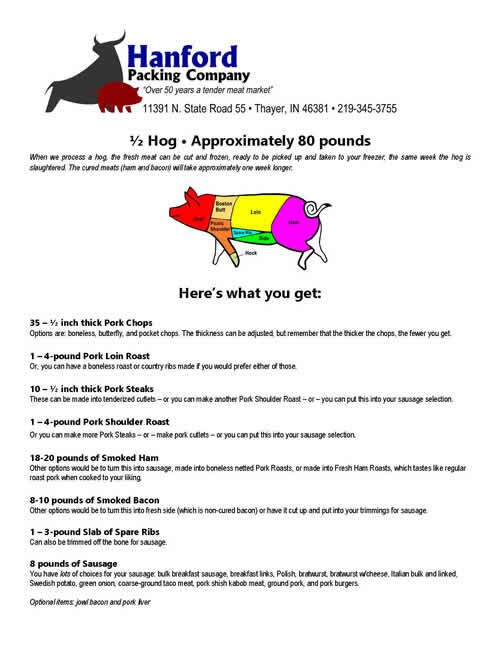 The meat trimmings will yield approximately 30 pound of ground beef and will be approximately 80% lean (better than the “ground beef” most stores sell) packaged in 1 pound, 1 ½ pound, 2 pound, 3 pound, or patties. 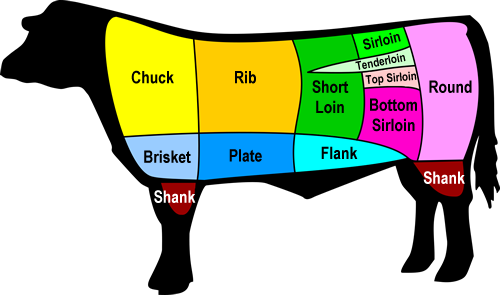 Optional items: Flank steak, Skirt steak, Brisket, Beef liver, Beef heart, Beef tongue, or Oxtail. Options are: boneless, butterfly, and pocket chops. The thickness can be adjusted, but remember that the thicker the chops, the fewer you get. Or, you can have a boneless roast or country ribs made if you would prefer either of those. These can be made into tenderized cutlets – or you can make another Pork Shoulder Roast – or – you can put this into your sausage selection. 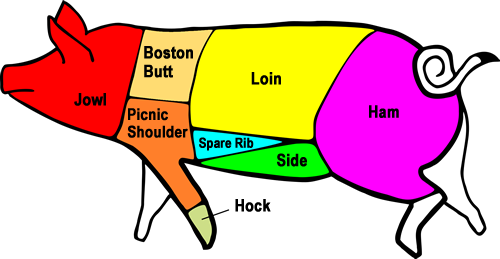 Or you can make more Pork Steaks – or – make pork cutlets – or you can put this into your sausage selection. Other options would be to turn this into sausage, made into boneless netted Pork Roasts, or made into Fresh Ham Roasts, which tastes like regular roast pork when cooked to your liking. Other options would be to turn this into fresh side (which is non-cured bacon) or have it cut up and put into your trimmings for sausage. Can also be trimmed off the bone for sausage. 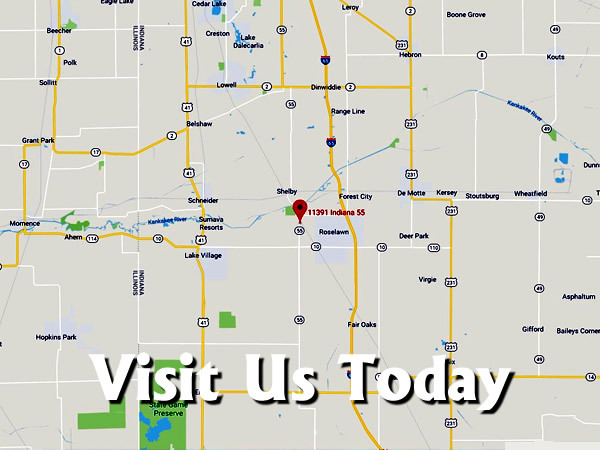 You have lots of choices for your sausage: bulk breakfast sausage, breakfast links, Polish, bratwurst, bratwurst w/cheese, Italian bulk and linked, Swedish potato, green onion, coarse-ground taco meat, pork shish kabob meat, ground pork, and pork burgers.